Triple K Leather Holster Secret Agent 420-10 Colt 1911 Government Hi Power Star B Taurus PT92 99 58 Kahr Hammer Down Carry Thumb Break Right Hand Brown Walnut Oil CZ75 Hammer Back 3 ship Free! Description: This listing is for ONE Holster. Buy any combination of 3 non gun non ammo items, and shipping is Free for the entire order lower 48. Here is Triple K's standard Carry Lite holster for Colt Government Pistols and Clones, including the venerable Browning Hi-Power. Manufacturer is Triple K Manufacturing of San Diego. Type is high ride thumb break, on the order of the Bianchi Black Widow. Construction is single ply, .140 inch thick leather, with brass and steel snap assembly, and with close stitched cotton cord. This holster will accommodate Colt Government Pistols and Clones including the Star B series, Browning Hi-Power and clones. It is for resting hammer position, not for cocked and locked. A person wanting cocked and locked needs to know how to wet and shrink a leather thumb strap. Interestingly, this holster will accommodate a Taurus PT92 / 99 or PT58, but will NOT accept the Beretta 92 with levers on their slides. It will accept a Kahr Arms if the owner has some stretch time patience. It will fit onto a belt width of up to 1 1/2 inches; and sets the pistol with a 35 degree forward cant. Finish is smooth dressed but unlined interior, white cord, and walnut oil brown external surface. Each holster comes in its factory package with owner's manual and statement of warranty. Fit will be tight on a Taurus, so Taurus PT92, PT99, or PT58 owners should allow two to three weeks of stretch time before carrying. It will carry a CZ75 type pistol nicely on hammer back cocked and locked position, but Only if the CZ has a type 1 Round Trigger guard; it is a NO GO on a CZ75 or clone that has a square trigger guard, No Go for hammer down carry on CZ75. Replaccement pricing is $60 or more on triplek com, and upwards of $100 for a similar Bianchi. 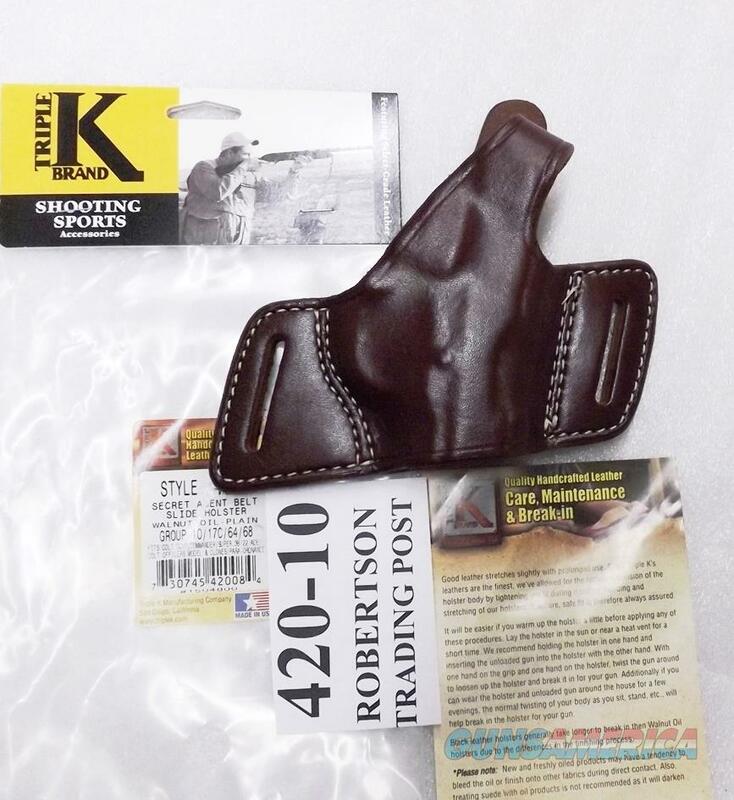 We're offering the holster in the photos , however, or one of its identical mates, for only	$ 36.00. Any firearms, personnel, or ammunition in the photos are Not included. >>>>>>>> $3 Lower 48 First Class Mail; $10 Priority to AK HI PR. FIRST CLASS MAIL will require REMOVAL of the item from its FACTORY PACKAGE. Buyers who want the factory packaging intact please select USPS Priority Mail.